The world's largest seller of gun supplies cannot keep up with demand as orders for assault weapon and high-capacity magazines sky-rocket in the wake of the Newtown school shooting. Pete Brownell, president of Brownells, said that in a three-day period the company has sold an "unprecedented" three-and-a-half years' worth of inventory of magazines. Posting on the shooting enthusiast message board AR15.com, Mr Brownell said: "The demand for magazines actually exceeded the ability for the system to keep up with the volume that was being ordered." He apologised to customers for the backlog and said the company is manufacturing at 100% capacity, and will increase production in coming weeks to meet the massive influx of orders - which could take months to deliver. "We're working like crazy to get these orders to you as quickly as possible," Mr Brownell said. With the debate over limiting high-capacity ammunition magazines heating up again after the Sandy Hook shooting , worried gun enthusiasts are stocking up while they can. The semi-automatic Bushmaster AR-15 rifle was the style used by gunman Adam Lanza when he killed 20 children and six adults at the Connecticut school on December 14. It was also the model used in July by suspected Colorado movie theatre shooter James Holmes in the rampage that killed 12 people. The Sandy Hook shooting is the latest in a string of mass shootings in the United States, which has far more lax gun laws than in most other developed nations. In the latest shooting , two firemen have been killed and two injured after going to put out a house fire in New York state. Florida, the most heavily armed state, rocketed this week to a new record of active carry permits - over one million - a state government spokesman said. Florida has 19 million people. Newspapers in rural areas around the country also reported a roaring pre-Christmas trade in guns and magazines, especially at gun shows, long considered a loophole by gun control activists as they often do not require buyers to undergo any background checks. 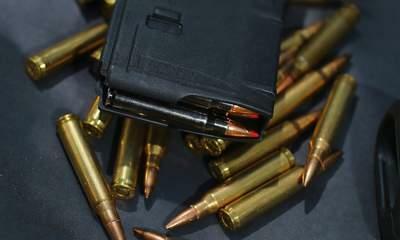 There were an estimated 310 million non-military firearms in the United States in 2009, roughly one per citizen. US President Barack Obama said he would support a new bill to ban assault rifles and put Vice President Joe Biden in charge of a panel looking at a wide range of other measures, from school security to mental health. Democrat Senator Dianne Feinstein has pledged to table a bill on January 3 that would ban at least 100 military-style semi-automatic assault weapons, and would curb the transfer, importation and the possession of such arms.